Another bad week for the Education Secretary. Captions please. This entry was posted on Saturday, July 31st, 2010 at 2:36 pm	and is filed under Home. You can follow any responses to this entry through the RSS 2.0 feed.You can skip to the end and leave a response. Pinging is currently not allowed. Come in fortyone – your time is up ! Only just off the start line Michael Gaffemacher finds himself back-pedalling- straight into a BSF school building he had cut from the programme. Despite the shock of the collision he remains oblivious to the fact that the vehicle, sponsored by Wikileaks, has been adorned with the actual number of schools to have registered a formal interest in academy status, thus ensuring further back-pedalling within the first lap. Meanwhile the head of the would-be-axed school, smiles knowingly, thoroughly enjoying the unanticipated spectacle. 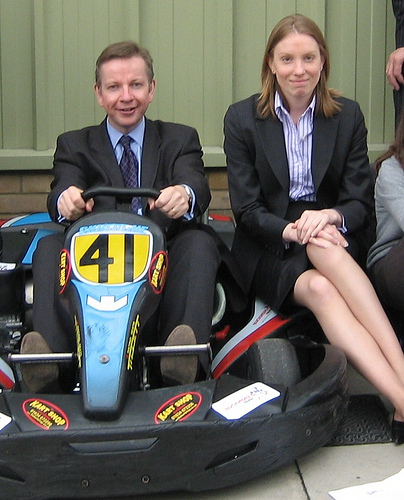 I shall call this my Gove-kart! Come in Number 41, Your time is up. Better sit on it – must not let this little boy actually drive it ! Wonder where his mum got to ? On your mark – get set – oops ! nowhere to go !! Choice of ministerial cars was limited after Labour had screwed the nations finances.